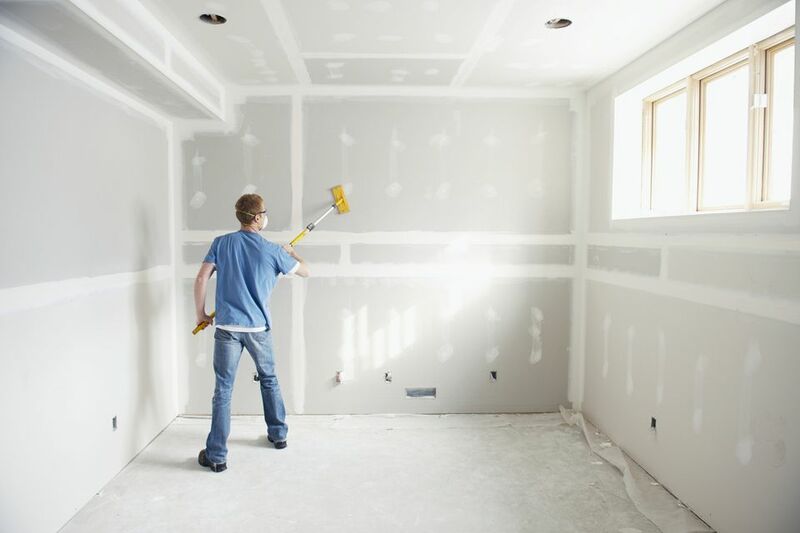 Drywall goes by a few names such as gypsum board, wallboard, gyp board, plaster board or Sheetrock, but whatever name you give it, the stuff will need repair at some time. Drywall is a modern building material that comes in large panels (typically 4 feet by 8 feet) having a gypsum core sandwiched between two heavy paper faces. These paper faces are often made from recycled paper. One face is very smooth and is the surfacing face and the other is more of a kraft paper backing face. Here are some ways to fix some pretty common drywall problems you may have around your home. Instead of the preferred method of using construction adhesive and drywall screws to fasten drywall to the studs or ceiling joists, many homes are built using just ring-shanked nails and no adhesive. Although using only ring-shanked nails is certainly an accepted method of construction, it does create problems later on as the wood studs dry out or warp slightly creating pressure on the drywall beyond the holding ability of the ring-shanked nail. So then you are left with little "nail pops" that are "oh so much fun" to try and repair because you have to patch and paint. Fasten a 1 1/4-inch, #6 coarse-thread drywall screw above and below the popped nail. Make sure to fasten the screw just to the point where it is just below the surface of the drywall paper, not so much that it punctures the paper surface. If you cannot get the drywall screws you can use the same ring-shank nails that caused the pop in the first place. Drive them in above and below the popped nail until the nails are slightly recessed and there is just a dimple in the drywall surface from the head of the hammer. Apply a first coat of premixed drywall joint compound or spackle. Apply a second coat of compound once the first coat dries making sure to feather the edges. Use at least a 4 to 6-inch flat blade taping knife (it can be the cheap disposable type). Wait until the compound is fully dry, about 24 hours, then lightly sand using a sanding block and about 200 grit sand paper. Do not sand just using your hand or fingers! You must have a solid backing to the sand paper for proper results! Once dry, check the repair. If the compound shrunk or you see pitting, repeat the application of joint compound and sanding. Once the repair is dry and sanded smooth (close your eyes and feel the repair with your hand), ​you can prime and paint. Use a 4 to 6-inch flat blade taping knife (cheap disposable plastic type is okay) to apply spackle or premixed drywall joint compound to the dented area. Once the repair is dry and sanded smooth (close your eyes and feel the repair with your hand) you can prime and paint. Cut away the damaged section of drywall tape using a very sharp knife or break away razor utility tool. Then carefully pull off the damaged section of tape. You will also be pulling off little bits of dried drywall joint compound, that's okay. Using a 4-inch drywall flat blade taping knife (again, the cheap plastic type is okay), apply premixed drywall joint compound in the opened drywall joint as a bedding for the new tape. Make sure to apply the compound so it fully covers the tape width and length. Cut your new section of drywall tape to length. Using your slightly wetted 4-inch drywall flat blade taping knife, center the drywall tape on the joint and while holding the taping knife at about a 45 degree angle, run the knife down along the tape, pressing it fully and firmly into the joint compound bedding. Compound will ooze out around the edges and that is a good thing. Allow to dry overnight and scrape away any high spots with the taping knife the next day. Apply a second coat of joint compound using a 10-inch taping knife. Again using a slightly wetted taping knife, apply a second coat of premixed joint compound that is 6 to 8 inches wide and covers thew first layer of compound. Holding the taping knife more at a 90 degree angle to the taped joint, draw it down the taped repair in one smooth stroke. Remove any excess from the edges. What yo want is the taped area to be fairly smooth. It may have some bubbles in it but that is OK. Apply the third and final coat of joint compound again using a slightly wetted 10-inch taping knife. Apply the joint compound to an area that is about 8 to 10 inches wide. Allow to dry overnight and scrape away any high spots with the taping knife the next day, then lightly sand using a sanding block and about 200 grit sand paper. Once the repair is dry and sanded smooth (close your eyes and feel the repair with your hand), you can prime and paint.